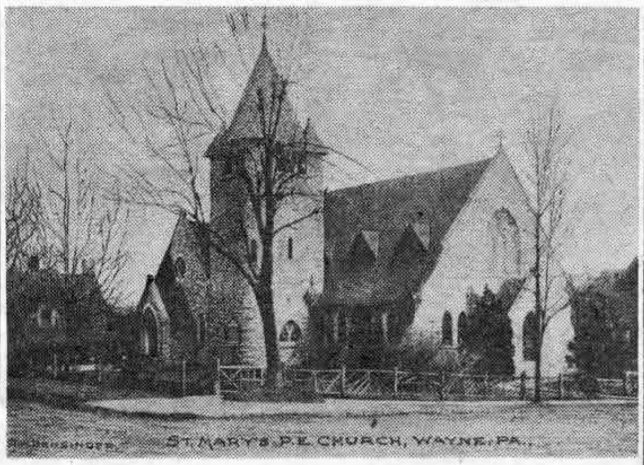 A description of the founding of St. Mary’s Church, in 1890, was presented in this column, September 28, as told in the book, “Rural Pennsylvania.” This interesting volume, published in 1897 by George W. Jacobs and Company, Philadelphia, contains brief articles about old churches and homes in the vicinity of Philadelphia, many in the Wayne area. The book was compiled by the Rev. S.F. Hotchkiss, of St. Luke’s Church, Philadelphia, from articles written by authors of that period. 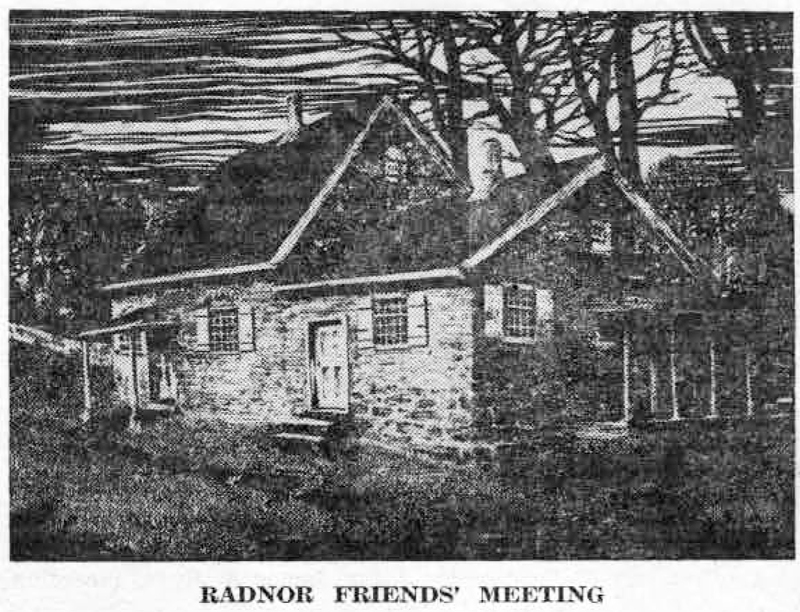 Today, we are quoting Joseph F. Doran, on the old Radnor Friends’ Meeting, which should be of interest to readers, as a supplement to a series on the meeting house which appeared in this column previously. “Probably the most interesting historical landmark in Radnor township is the old Radnor Meeting House, Old Conestoga and Old Radnor roads, Ithan. Built about 1717, it is closely identified with local history and with families of early settlers. The Radnor, Haverford and Merion Meetings were, as Glenn says in ‘Merion in the Welsh Tract’…. practically one and the same meeting, although they separately controlled in turn yearly, monthly and preparatory meetings of Friends. The records of these meetings, for a number of years, were not entirely separated, which is frequently confusing. These records are historically rich. “During the Valley Forge encampment, the meeting house was used as officers’ quarters and a hospital for the American Army. The records of the Society show that it was deprived of the use of the meeting-place because of military occupancy and it required considerable repair to recondition it for meetings, which were not resumed until 1780. “The peaceful quiet of the Society was broken when members entered military service in defense of their country during the Revolution. The records of the monthly meetings in Delaware county show that 110 young men were disowned by the Society for bearing arms. This quaintly phrased, reference to the lovely old church building, still standing in Ithan, tells something of its early vicissitudes in the days when 110 of its young men, and others in nearby Quaker Meetings, were disowned by the Society for bearing arms in the American Revolution. The picture of St. Mary’s Church shown above presents one of the most striking examples to date of the statement made from time to time in this column that the story of how information for “Your Town and My Town” is obtained is often quite as interesting as that information itself. When last week’s story of the founding of St. Mary’s Church in 1889-1890 was written, the writer made an extensive search for an early picture of the edifice to accompany the article. In the interval between the writing of the column and this one, the writer received a note from Mr. Harry Creutzburg, of Wayne, containing several postcards of old Wayne. The note explained that Mr. Creutzburg was lending them for use in this column. Mr. Harry Buten, of Merion, had sent them and Mr. Creutzburg felt sure he would be glad to tell me how he had obtained them and other old post cards showing various locations, some dating back to the 1890’s. A telephone call from Mr. Buten was most informative. Though distinctly not a collector of old postcards, he has obtained many when purchasing stamps for his extensive collection. As one of the country’s best-known philatelists, Mr. Buten is now president of the National Philatelic Society. Upon recently receiving several Wayne postcards from Mr. Buten, Mr. Creutzburg told the former that he was lending them to this writer for possible use in this column. His interest aroused, Mr. Buten phoned the latter last week in regard to his postcard collection. A thick envelope of Wayne postcards arrived in the next morning’s mail. The first picture seen was one of St. Mary’s Church, just the picture this writer had searched for last week. And yet not once had the fact of that search been mentioned in the call of the previous afternoon. To date this is probably the best example of the statement made in the opening paragraph about obtaining information for this column.